Zambeza’s autoflowering Jack the Ripper brings us the famous Jack Herer in an easy to grow autoflower. Thanks to the premium Jack Herer genetics, Jack the Ripper grows fast with good yields and with the same spectacular high and outstanding flavour of her feminized sister. A top-grade sativa of the highest quality for all those who love autoflowering strains but don’t want to make any compromises! Named after the “Emperor of Hemp”, famed cannabis activist and writer, Jack Herer is a sativa-dominant strain of outstanding quality. 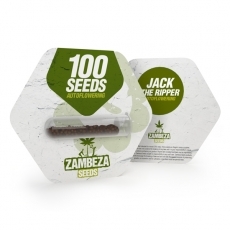 Zambeza took this cannabis legend and gave her autoflowering qualities to create their Jack the Ripper Autoflowering. Out comes a true premium autoflower that shines like her bigger sister, a top sativa that everyone can grow. Jack the Ripper Autoflowering has a reasonably short life cycle of 60-70 days from seed to harvest. In this time, Jack will grow to a height of 60-90cm indoors where she can yield as much as 350g/m². If you grow her outdoors and make sure that she gets plenty of sunlight you can look forward to harvests of up to 130g per plant in optimal conditions. Seeing that she is an autoflower, she’s very easy to grow so that even less experienced growers can now grow this sativa legend without troubles. There is no question about the excellent quality of the original Jack Herer. This super-potent sativa even made it into Dutch pharmacies where she is being distributed as a medicinal strain. It is because of her excellent genetics and her THC level of 17% that Jack the Ripper delivers a powerful uplifting sativa high that is euphoric and happy, just the right smoke to help with depression and other mood disorders. Jack the Ripper also shines with an excellent aroma that blends sweet, sour and bitter notes for a complex yet very pleasant smoke experience. Sometimes, growing an autoflowering variety of a famed strain can mean having to make compromises when it comes to potency, aroma or yields. Zambeza’s Jack the Ripper Autoflowering comes pretty close to the original and sure won’t disappoint! This is an excellent autoflower for all those who want to grow a world-class sativa while being able to enjoy the easiness and convenience of an autoflower! Jack the Ripper bulks seeds are available in packs of 100 seeds, making them a good choice for everyone who needs larger quantities of this great autoflower!